I loved "Dark Shadows: when I was a kid. It was a soap opera, but instead of all that boring kissing, there were vampires! Witches! Warlocks! Creepy crypts and crashing waves! Grave-robbing! And, of course, Jonathan Frid as Barnabas Collins. 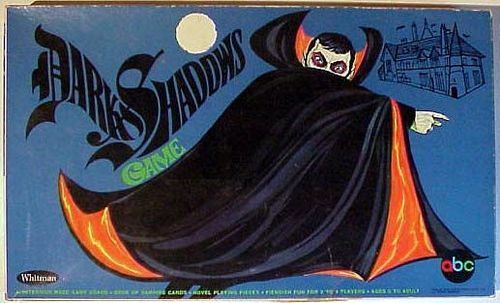 There were actually two "Dark Shadows" board games. The one in the commercial below is probably the most valuable--the "Barnabas Collins" game. It came with a coffin, bones to build a skeleton, a stake, and fangs you could wear. I imagine there aren't too many of those games left intact--too many pieces for little knuckleheads like us to lose. I had the other one, called simply "Dark Shadows," and pictured and described so well here. You collected creepy-motif cards, depicting goblets, spiders, knives and bats. You have to have the right card to move ahead, or something. But man, around 1975 I knew every rule of this game backwards and forwards. My best friend, Brenda, and I played it all the time. And then we moved, and for some reason, I thought it would be this great generous gesture to GIVE Brenda the "Dark Shadows" game. I did, but man, I regret that magnaminity still. It was a great, great game. What's your favorite long-lost board game? Or do you want to talk "Dark Shadows"? I became obsessed with Dark Shadows about 10 years ago when they showed the entire series on the Sci-Fi channel. So campy! So addictive! Loved, loved, loved Dark shadows as a kid. I remember running home from school to watch it. It was the highlight of the day. I had the Barnabas Collins game. Those fangs got REALLY gross after a while. Anyway, I watched Dark Shadows again on SciFi a few years ago. Still enjoyed it, but I had forgotten that it moves in soap opera time. SLOWLY. The "Barnabas Collins Dark Shadows" game is available at auction websites such as EbAY. I have several of them. Sets with the glow-in-the-dark fangs are hard to obtain and highly collectible.